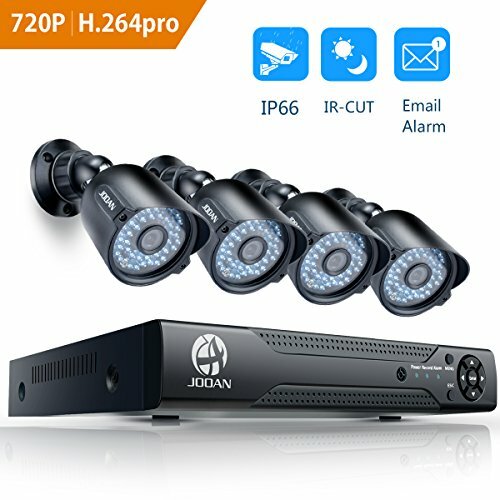 security camera system:(Surveillance DVR Kits): Firm quality TVI camera, 4 TVI 720P camera(with 3.6mm lens) for excellent video quality & clarity viewing; Cameras built in IR Cut Filter ensures true color. 1.0MP IR AHD Camera IP66 Outdoor/Indoor Camera Day/Night, 42pc LED IR Distance 131ft. Advanced AHD(Analog+network HD), DVR/TVI/NVR/CVBS/CVI 5-in-1 for long time Continuous Recording at Highest Resolution. Easy setup DVR: Equiped with HD/VGA port for video output; The DVR supports 500GB- 6T hard drive:WD HDD purple(recommended). Transmission distance: Adopting coaxial transmission, long distance transmit range (up to 1650ft) of TVI 720P Live Video. Connection instruction video: https://www.youtube.com/watch?v=K8gl6NiZ_j8. One year quality warranty,Lifetime Tech Support. Any problem or suggestion pls do not hesitate to contact us firstly. Thanks a lot ! ! (Customer service email: technicalreply@qacctv.com; Skype: market@qacctv.com).Service online: 5 PM ~ 2 AM (PST).